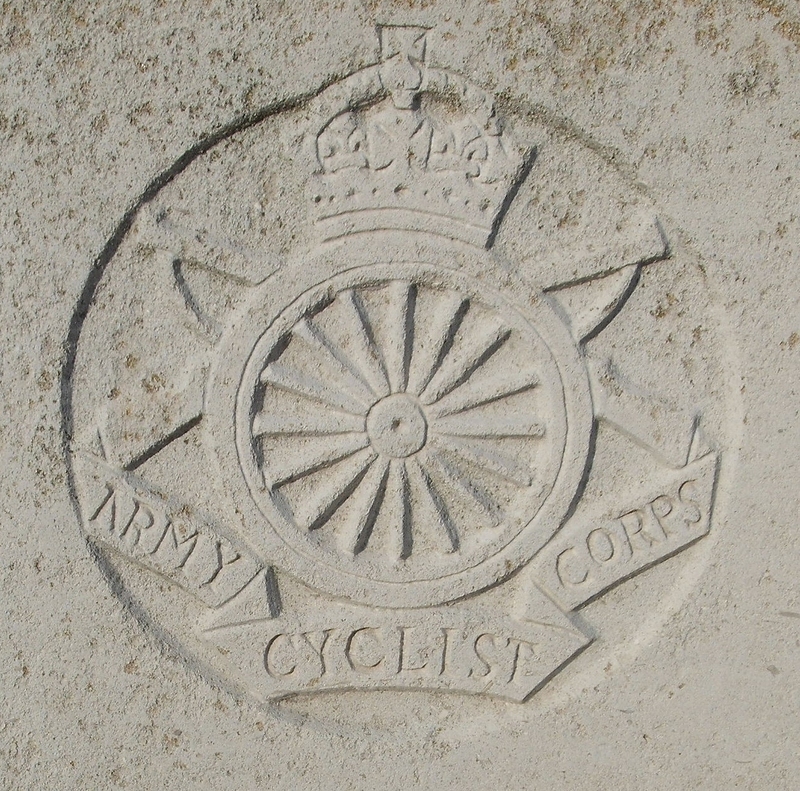 48th (South Midland) Divisional Cyclist Company, Army Cyclist Corps, 48th Division, T.F., B.E.F. Next of Kin: Son of Frederick Layton of Ivy Cottage, Yates Hay Road. Hubert Layton, a motor engineer was born in October 1895, the son of Frederick Layton of Ivy Cottage, Yates Hay Road. Like many in Malvern Link he went into the motoring trade, giving his occupation as motor engineer when he joined the territorial force in May 1913. He joined the 8th Battalion of the Worcestershire Regiment, along with many others at this time responding to the increasing international tension. He was mobilised with the rest of the Battalion in August 1914 and went to camp. Divisional Cyclist Companies were formed in late 1914, and the South Midland Division’s Company formed at Chelmsford on the 3rd December 1914 with a seconded officer from each infantry battalion and 15 or 20 other ranks. Hubert Layton was one of these men. The cyclist company was envisaged to provide a mobile divisional reserve and, in conjunction with the divisional mounted troops perform a reconnaissance role. The Company, with the rest of the Brigade left for France at the end of March. Once in France, the Divisional Cyclists performed a number of various roles, mostly improving defences and observation patrols. In June it was decided that the Cyclists and the Mounted Troops (‘B’ Sqn, King Edwards Horse) should work together, but it was obvious even by then that in static trench warfare, the days of mounted or mobile troops at divisional level were numbered. From August onwards, Layton was admitted to hospital with various skin complaints, which as it transpired were chronic eczema. Around Christmas 1915 he was admitted to hospital for a final time, and in a base hospital in Rouen it was decided that his condition was serious enough to warrant his transferral to England. He was transferred to the 3rd line unit in Sutton Coldfield, but after nine months his condition was no better. A scratch whilst working in a Warwickshire coal mine five years earlier, a medical board was told, had resulted in eczema spreading over his right arm. Since then it had extended over his left arm and both knees. He was honourably discharged on the 21st September 1916.